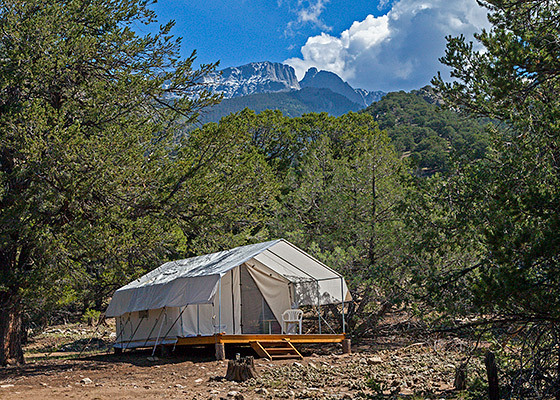 An elevated wall tent near the campground on the outskirts of our campus with views of Kit Carson and Challenger Point. 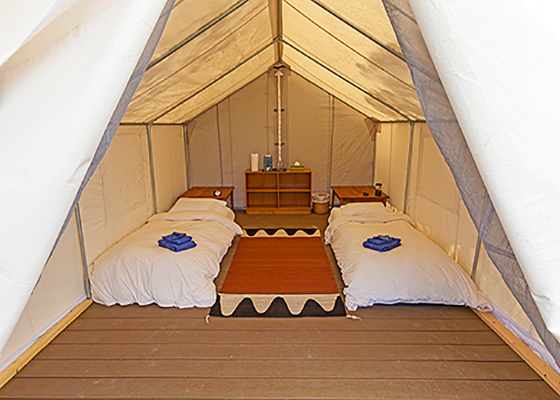 The tent has a deck, two single beds, tables, bookshelf, canvas shelves, hooks for clothing and can accommodate one or two people. The Guest House bathrooms and showers are a 3 minute walk away. There is also a composting toilet nearby. The Tent does not have electricity or heat and is available from May through September. Wireless internet is available in the Guest House and Main House Atrium. Due to high fire danger, building camp fires or using camping stoves is not permitted. We are in Black Bear Country. Your food needs to be stored in the Main House and toiletries need to be stored in the Guest House bathrooms.